Seemingly always with a smile, Junior Seau took his own life Wednesday at his home in Oceanside, Calif.
LOS ANGELES — When athletes and celebrities die I’m always conflicted. Most often, the news is tragic (see Houston, Whitney), as it is when any life ends too soon, but in nearly all cases I didn’t know the person. I sympathize for their families, but their loss only affects me on a superficial level, as I can no longer enjoy what it is that made their family member famous in the first place. If it’s someone in the sports world, it’s the joy I get in watching them play, reading their perspectives or listening their commentary. If it’s an entertainer, it’s enjoying their movies, music or prose. Superficial relationships. Their death hardly impacts my daily ongoings aside from pausing to reflect on what their life meant in mine. When Michael Jackson died in June of 2009, my buddy VA and I did a podcast about his music and how he’d be remembered, same when the wrestler “Macho Man” Randy Savage passed nearly a year ago. They were important to us at one time, so we stopped to think back. Wednesday’s news was different. 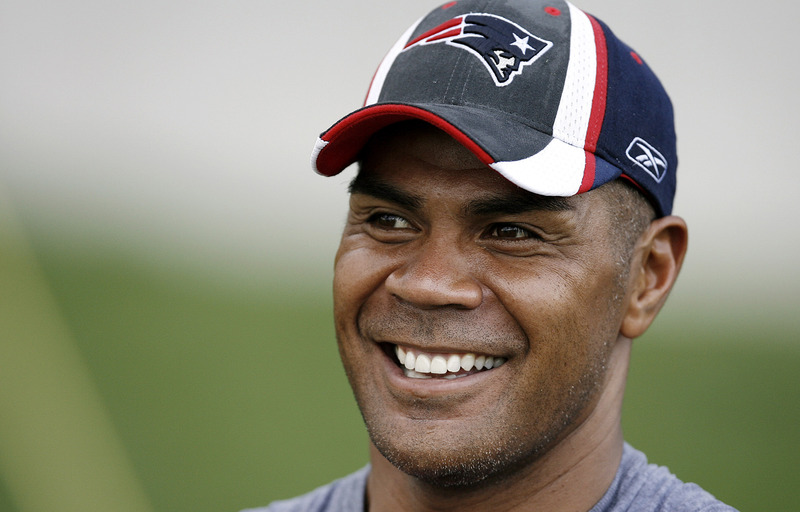 I learned of the death of NFL legend Junior Seau stopped at a red light, scrolling Twitter. I found it strange he was the top trending topic in Los Angeles because he hasn’t been in the news for a while now, but I guess I should’ve known what I was about to find out; Twitter’s killed more people than polio. 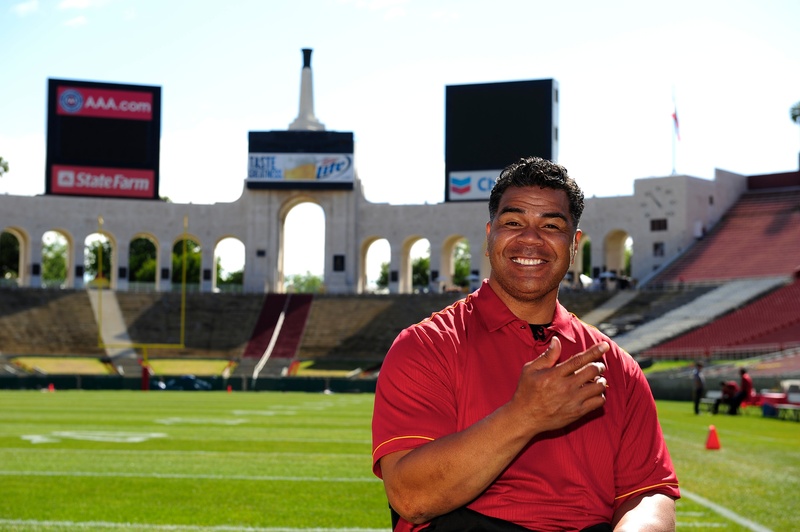 Seau was in good spirits at the USC Spring Game just a little more than two weeks ago. TMZ, our nation’s leading breaking-news source (for better or worse), said that Seau had died in an apparent suicide; a gunshot would to the chest, in his Oceanside, Calif. home Wednesday morning. The website, which has enjoyed remarkable success in the last four years (since it was the first to report the death of Michael Jackson) publishing literally anything you can think of regarding the ultra-famous and self-glossed so, was first to report the news. It said Seau sent text messages to his ex-wife and three children Tuesday night and they responded as they would without concern. Police later said he was found by his girlfriend and that reviving efforts were unsuccessful. NFL Network and ESPN held off on reporting the news until they had confirmation, which came later in a statement from the San Diego Chargers. Getting it right is more important than being first. I applaud them. Putting Seau’s crying mother on live television, however, was irresponsible and classless. No rating could ever justify taking advantage of her grief. No. 55 was one of those NFL players who seemed to have more fun that he should on the field. 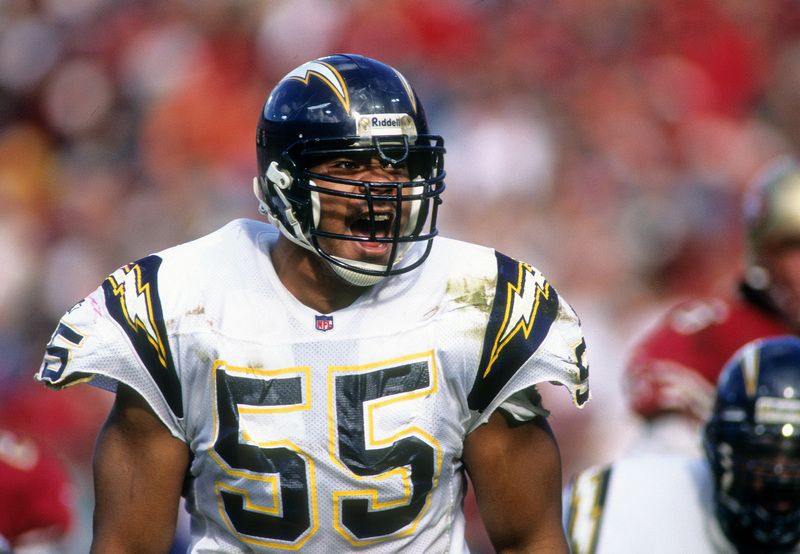 But the death of Seau is troubling and sad for so many reasons. He played 20 years in the NFL, made 12 straight Pro Bowls, led the Chargers to the Super Bowl and will be a first-ballot Hall of Famer. Being “Junior Seau, NFL linebacker” defined who he was. He was a warrior. He was the leader of his men. He was the best. Being away from that world was not easy for him, I’m guessing. Though he never appeared on the injury report as suffering from one, I’d assume he suffered numerous concussions as well as injuries, and undoubtedly, depression. We’ll never know if that led to him taking his own life, but he’s part of a troubling trend in recent years. Seau becomes the third former player to commit suicide in the last year-plus, and the eighth member of the 1994 Chargers to have passed away unexpectedly. This post-playing depression is real and needs to be addressed. I’d venture to say that’s why Roger Goodell came down as hard as he did in the Saints Bounty scandal — four players were suspended Wednesday for their part, including Jonathan Vilma for the entire 2012 season, joining Saints coach Sean Payton on the outside looking in this year — and will continue to push for player safety, much to the dismay of James Harrison. None of us want to see this game reduced to aggressive flag football, but we can’t have any more days like Wednesday. 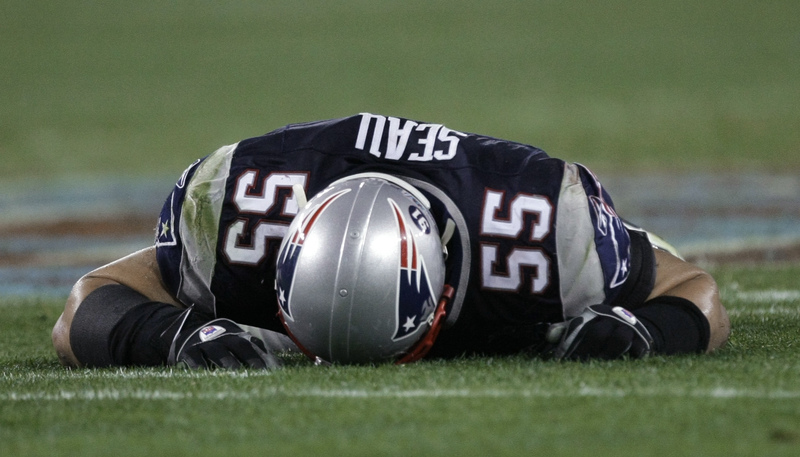 If it can happen to a consummate pro like Junior Seau, Number 55, then it’s happening to many, many more and that’s a problem. A major one. I played football growing up and in four years of high school I only remember blacking out once after a hit – it was scary and on film you can see me stumble back to the huddle. I had the chance to play Division III but didn’t want to; the potential wear and tear on my body wasn’t worth it, and I was realistic in that I’d be little more than a tackling dummy for a couple years. I’m glad I made the choice I did. My lasting image of Seau will be a big smile, a haircut I always found strange and that enormous, exuberant, fist punch into the air he would make in the backfield after a punishing hit on a would-be play maker. Not only was he an incredible player but he did so much for the San Diego community with his charitable causes. It was touching to read the accounts of Mike Silver and Jim Trotter, national sports writers who knew him well through their years covering the league. A man who gave everything on the field, Junio Seau, couldn’t move after losing in Super Bowl XLII. He never won a Super Bowl title, coming oh-so close with the Patriots in 2007 and we can only hope that he’ll be a champion in death, this being a wake-up call for the entire NFL family. That’s something I wouldn’t feel conflicted about. Posted on May 2, 2012, in NFL and tagged Chargers, Junior Seau, Michael Jackson, NFL, Patriots, TMZ, Twitter, Whitney Houston. Bookmark the permalink. Leave a comment.